Social and mobile game company King has launched its newest title on Facebook: Diamond Digger Saga. 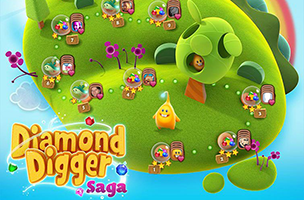 In keeping with the company’s other ‘Saga’ titles, including Candy Crush Saga and Papa Pear Saga, Diamond Digger Saga is a level-based puzzle game, which asks players to clear gems from the board to dig into the earth. In each stage, players have a limited number of moves with which to dig a path through the earth for water to reach the bottom of the screen. This is done by clicking on groups of three or more touching, like-colored gems. Gems aren’t required to be in a straight line, so any combination of touching gems qualifies for removal. Water constantly flows downward, until it hits a blockage in the path. The gems aren’t blockages; rather, the sand or other obstacle squares the gems sit upon (like sand squares) are important. Each level contains multiple “rooms” or areas to clear before reaching the final room, and players receive free bonus moves for clearing each room. Eventually, levels become more complicated with additional goals, like waking fireflies by surrounding their tiles with water, or collecting keys to unlock the path to the next room. Gamers earn up to three stars on each level, depending on their score, and can compare their scores with their friends on each level-specific leaderboard. A lives system limits the length of a single gameplay session, but players can purchase lives with real money to keep playing indefinitely. Diamond Digger Saga has over 2.1 million monthly active users and climbing, according to our app tracking service AppData. The game is available to play for free on Facebook.